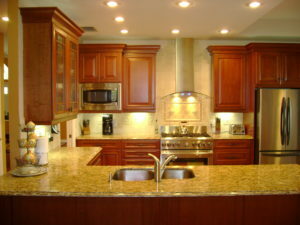 Kitchen remodels are one of the most common and desired home renovations. If you haven’t been one of the many homeowners who has prided themselves in redoing their kitchen, you might have at least thought about doing it. Surprisingly, there is a lot of work that goes into remodeling your kitchen, aside from the actual construction work. If you are wanting to invest the money into a custom-built kitchen, you should get an idea of what style of kitchen is right for you. You might be wondering what style of kitchens there are. Aside from being used to prepare and consume food, not every kitchen is used for the same purposes. Food bloggers sometimes use their kitchen as a place to create content for their business. Parents that frequently host after-school playdates might need a large island to serve snacks. If you are the type to host many dinner and holiday parties, you probably want a large stove. Either way, each person needs different qualities for their kitchen. It is important to determine how you plan on using your kitchen and what components will suit your lifestyle. If you are interested in having a certain theme throughout your house, make sure you keep track of those details. For a farmhouse-style kitchen, you probably don’t want the same cabinet colors and handles as someone with a modern-style kitchen. There are endless amounts of colors and themes to choose from, so you need to narrow down your choices. A big mistake people often make when renovating their kitchen is focusing only on aesthetics and not storage. Remodeling your kitchen is your chance to plan for a new pantry or built-in spice rack. It is important to have a basic sketch of where you would like to have storage features for your design process to run smoothly. The designers working on your kitchen are going to want to know specifics, so make sure you have these ready for them prior to your meeting. Renovating your kitchen doesn’t have to be full of complicated preparations. If you are ready to provide detailed plans and sketches to us, the process will run smoothly.